The original bias network (black) allows the bias point to drift as temperature increases. Addition of a complimentary transistor and network (red) counteracts this drift, and maintains the bias set point. As a result, heatsink temperatures are reduced by 10 degrees F.
The M-1.0t has to be one of the most under-rated amplifiers of all time. It's rumored that this was done to fit the m-1.0t in the model line (0.5, 1.0, 1.5 and 4.0). It's also suggested that it was rated at 200W to match the Conrad Johnson Premier V rating (the $12,000 tube amplifier it was transfer function modified to sound like). This is the amp that won the famous Stereophile Magazine Carver amplifier challenge. Nine months ago I started experimenting, and the Carver Mk II modification upgrade is the result. Each amplifier goes through a 2 track process. Troubleshoot: Component level fault isolation. 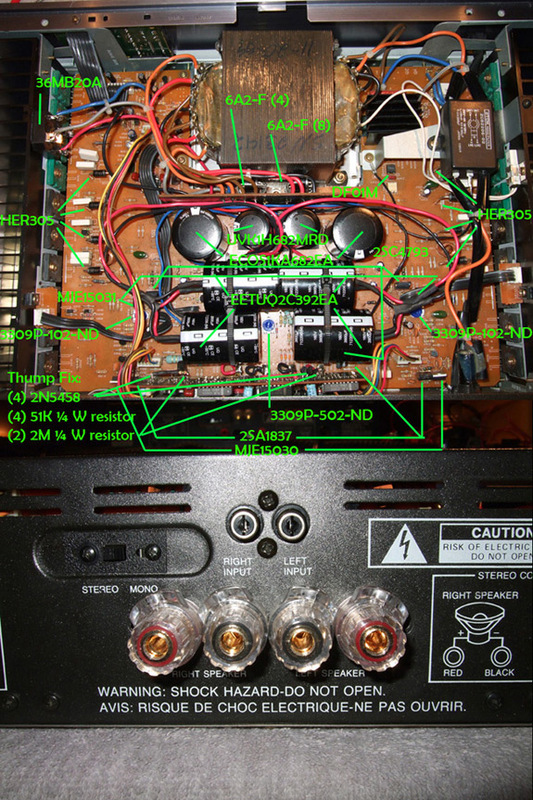 Repair: Replace any malfunctioning parts; bring the amplifier to working status. Align: Perform all published alignment and service bulletins. Calibrate: Verify performance against published specifications. Augment: Replace all voltage rectifiers with higher current devices. Boost power supply rail voltages. Re-design gain stage for new rail voltages. Replace all electrolytic capacitors and pre-drivers with higher voltage/current devices. Increase capacitance from 26000 uf to 43000 uf. Remove output transistor solder and replace using 7% silver solder. Install M-1.0t's infamous Turn on/off thump fix. Calibrate: Benchmark to new specifications. Perform 96 hour burn in at 1/3 power into 4 ohms. Final alignment. The result is an amplifier with a much higher power rating, more headroom, less commutation distortion, better current sourcing and performance into low impedance loads, as well as tighter bass and transient control. This	option adds parallel (current sharing) transistors to the low tier rail, as well as higher current transistors to the high tier rail; parallel output devices help prevent the power rail from sagging under heavy loads. As a result of these additional modifications, the M-1.0t Mk II opt 002 is the MOST POWERFUL Carver amplifier, excepting the Silver-7t/9t monoblocks (selling for $1,200 - $1,400), and the TFM-75 (very rare, selling for > $1,000). For home theater use, it can be used to power the front left and right speakers by connecting the amplifier to the HT receiver preamp outputs. If your HT receiver has no preamp outputs a line level converter may be used (I can make one for you if required). What happens if the amp fails? During the first 15 days, if you are unsatisfied, for any reason, with the M-1.0t Mk II you can return it to me and I will buy it back for the sale price + $50.00. As long as we're alive we will repair any M-1.0t Mk II sold for cost of parts plus shipping.